Stop paying to dispose of your recyclables and start getting paid for them today! We install the baling equipment in return for retaining the rebates from the baled commodities. 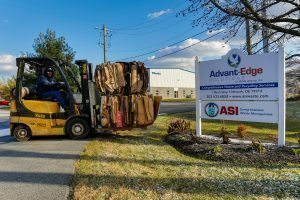 We collect bales of various materials for recycling. Through collecting baled materials, we are able to provide a rebate to our customers. which we can collect and deliver straight to a recycling center. Some commodities generate a rebate or can be accepted at no charge, avoiding the high tipping fees of solid waste. We typically are able to get rebates for shrink wrap, paper, and cardboard. We are then able to provide a rebate to our customers for the materials. 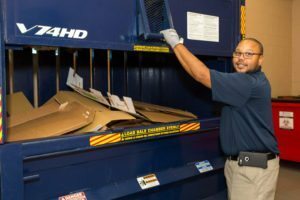 Baling is an excellent way to not only avoid disposal fees, but also to generate a rebate for items being discarded. If you have a large volume of paper, cardboard, shrink wrap, or plastics let us see if baling is a good option for you. We are able to provide new and used balers, available for purchase or as a rental, making it an option for any company with a large volume of a commodity. Call today so we can discuss generating rebates for your materials.